When my beautiful friend Stephanie announced that she was going to be hosting a tea cup exchange I was thrilled and signed up the moment I heard. Unfortunately, I haven't always had the best experiences with exchanges, but I just knew this one would be different and I am thrilled to say it was great! I was blessed to receive my tea cup from Julie at Idyllhours. 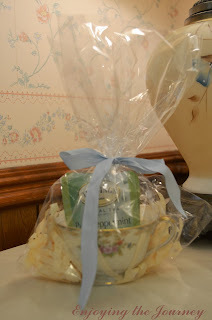 She gave me a beautiful vintage tea cup and I am so thrilled to add it to my collection. Normally I collect mugs (like these two from Stephanie), but this delicate tea cup is just beautiful so it will happily be displayed in my home when I am not sipping tea from it! When I started looking for the perfect spot to take pictures of my beautiful tea cup I could think of no better place than by my granmom's lamp. 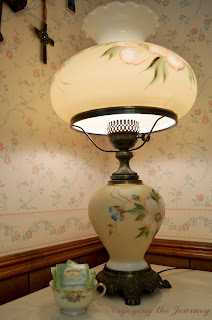 They complimented each other so well and not only am I thrilled to share my vintage tea cup with you, but I also got to share my family's vintage lamp with you all today. Many thanks go out to Stephanie for hosting such a great link up and to Julie for such a beautiful gift! Now I'm off to enjoy a spot of tea! What a lovely tea cup, Lauren! Julie Marie is a very sweet and special lady so I knew she would take good care of you :) I love the way you took the photos with your Grandmother's lamp! 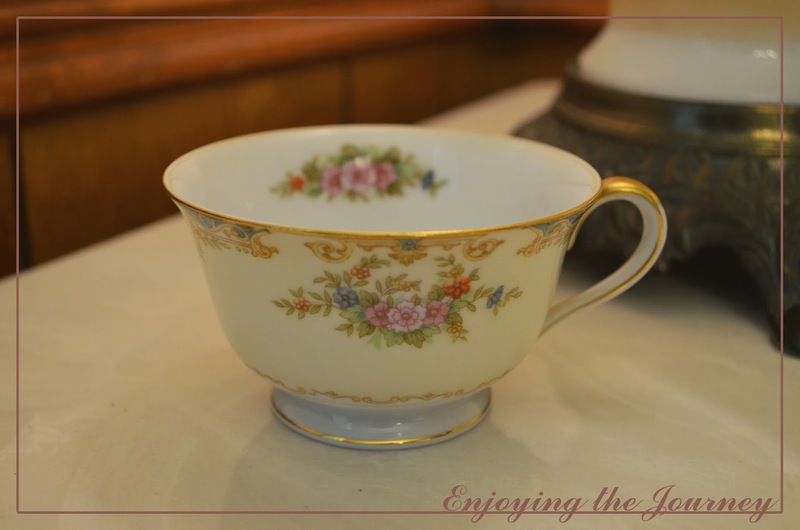 Thanks for joining, my friend :) You are more than welcome to come link up your pretty tea cup on my blog. How perfect it looks there in that vintage corner! So pretty. I love this exchange. I was assigned to send mine to Julie Marie. :) She's lovely. I like mugs too. I gave away all my teacups long ago, but had one more I could give away and this was perfect...made room for a new one from a new bloggy friend. Was nice visiting with you, Lauren. Hello Lauren, What a beautiful teacup you recieved from Julie Marie! It looks very nice next to your grand mothers lamp. I too joined the exchange though I do not have a blog. I am Stephanie's mother, so have had the privilige of meeting you lovely ladies through her blog. It is a lovely teacup. I even loved how it was packaged together. Enjoy! Lauren, your tea cup looks perfect next to your grandmother's lamp! The packaging is adorable too! What a perfect match for your very lovely lamp! So glad you had a good experience with the exchange...so fun. Thanks for sharing, nice to meet you. How fun - I haven't participated in an exchange yet, but a teacup exchange would be one to join! 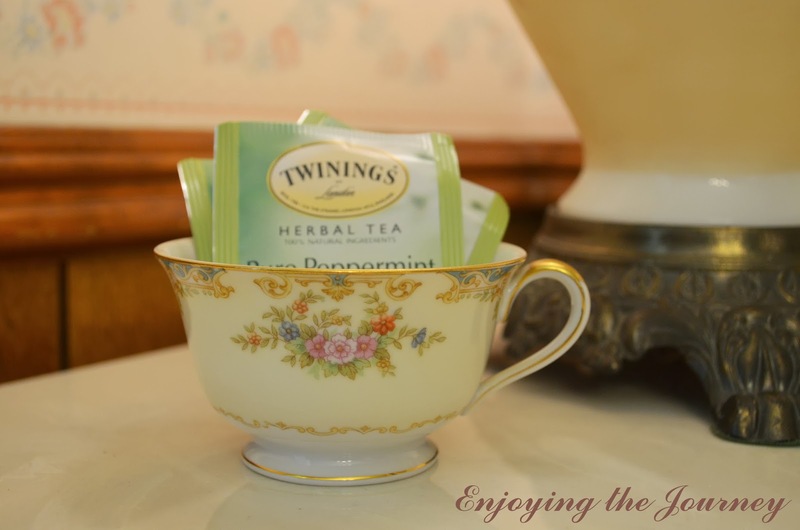 I love tea and sweet teacups too! Found you at the Monday Mingling blog hop - following via twitter! Hope you have a great week!